Διαθεσιμότητα : - Ετοιμοπαράδοτο / Παράδοση Αποστολής σε 1-3 μέρες. Traxxas TRX-4 KIT Crawler TQi, XL-5 (Χωρίς μπαταρία - φορτιστή). 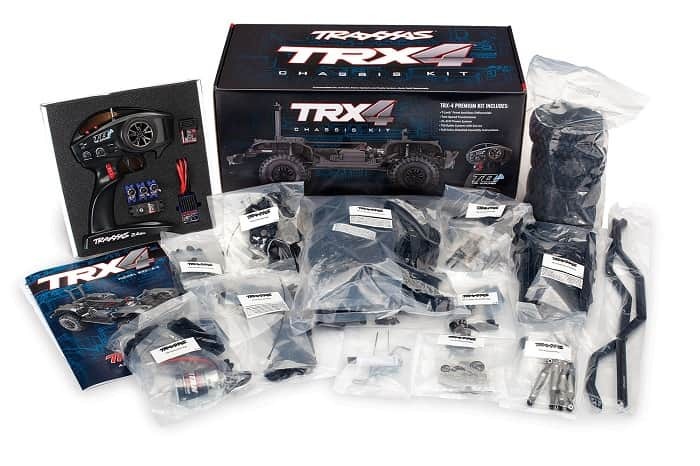 The Traxxas TRX-4 Scale and Trail Crawler set the standard for off-road versatility with its radical design and rugged durability. The new TRX-4 chassis kit combines the same innovative features as the RTR vehicle with the fun and excitement of building your own kit. Build your own portal axles, high/low range transmission, and remotely locking differentials. All the parts are organized neatly in labeled bags with waterproof electronics and pre-assembled shocks and suspension links. A fully illustrated color manual makes the kit as much fun to construct as it is to take off-road. The TRX-4 Chassis Kit isn’t just for expert hobbyists. Traxxas goes the extra mile to make the full-color instruction book easy to follow and fun to use. Each section corresponds to a labeled bag with step-by-step assembly instructions. True-to-scale part illustrations and ruler charts make it easy to differentiate between different screws, bearings, and gears. Helpful assembly tips and clear illustrations take the frustration out of the assembly process. Have fun on the workbench and on the trail with the new TRX-4 Chassis Kit.